Peanut is made from a fuzzy grey material with large blue and black button eyes. 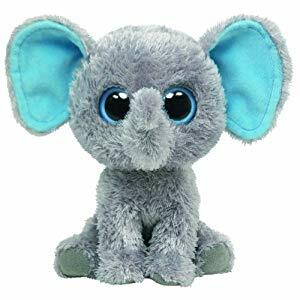 He has a long trunk and bright blue material for the inside of his ears. Peanut the Elephant was introduced on 1st January 2011. This is the second release of Peanut. The first version had pink on the inside of it’s ears and the tip of it’s trunk. He also was made form a fuzzier fabric than this version. This is the small 6″ version. He was also released as a medium 9″ Beanie Boo Buddy and as a key clip.